Link building is made easier with Google Analytics, with their URL Builder and the auto-tagging feature of AdWords. Analytics can be used to enhance a marketing strategy, and to monitor dimensions and metrics of web pages. The measurements that can be made with Analytics are numerous, and this post covers three features you may not be taking full advantage of. Since SEO is necessary for getting some visits from Search Engines, you may consider reading our SEO Tips before proceeding to the next para & read in details about the Analytics Intelligence & it’s usages. Automatic alerts are a handy tool in Analytics Intelligence. 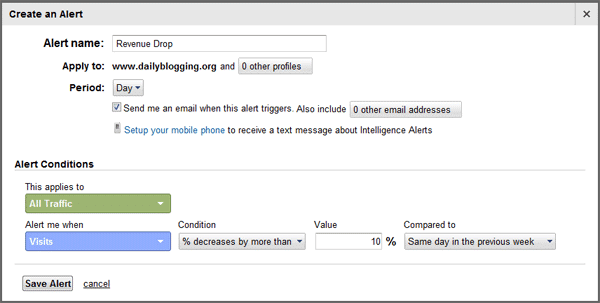 Say you want to be notified when the bounce rate from a certain country or region drops or spikes significantly. You can set the Alert Condition to monitor and report on significant deviations from the norm. Automatic alerts can also be setup to monitor spikes or drops in referral traffic from a certain site. Beneath the heading “Traffic Sources” is a graph button that when clicked, displays the traffic from whatever site you want to monitor closer. In order to set an automatic alert for noticeable traffic deviations, click “Create segment,” give the segment a name and save. This kind of segment will compare unique views, page views, bounce rate and other properties of a chosen site against the properties of other sites. These alerts can be setup to notify you once a day, week, or month. Daily alerts keep close tabs on what they are setup to measure. Weekly alerts do the same, but for a week’s worth of data at a time. The same goes for monthly alerts; they work on a month’s worth of data and return their results from that. Automatic alerts come with a slider labeled “Alert Sensitivity,” which slides from high to low. Setting the slider to high generates a lot of output, much like a -vvv, or verbose, program switch. Conversely, setting the slider to low results in notifications only when something wildly out of the ordinary occurs. Augment automatic alerts with customized ones, like this one for alerting when revenue decreases past a certain threshold. Under Revenue Drop Alert, fill out “Alert name” with a short phrase describing the function of the alert, say “Revenue Drop by 10%.” The “Apply to” field is for naming the page to watch. Period can be set to day, week, or month, and there is an option to receive an e-mail if the alert is triggered. Under Alert Conditions, set the Value to cpc, which means paid traffic. Then set “Alert me when” to Revenue, the Condition to “% decreases by more than”, and type 10% in the Value box. The “Compared to” field can be set to whatever you like, “Same day in the previous week” being a useful option. Friday’s traffic compared to Sunday’s may differ greatly for many types of businesses. Comparing the same day across weeks is often a more useful measurement. 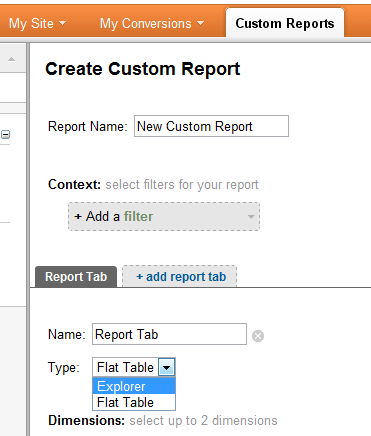 Since 2008, Analytics has featured custom reports, as well as many native report types. Right beside My Site in the main menu is the Custom Reports tab. The two tabs are named Explorer and Flat Table. Explorer tabs house Metric Groups like Page Views and Unique Visitors. Flat Tables show measurements side by side, meaning there is no need to click between pages to analyze data. Shared reports do not display their contents, just their respective structures. Keep in mind that when sharing reports, you must re-share the link if you change anything. Customization is a major selling point of Analytics, and Google’s latest version is capable of helping you measure pretty much any metric or dimension one can think of. If this post helped you in configuring and Setting up Google Analytics properly, then Subscribe to Our RSS Feeds / Daily Updates. So what methods do you implement, to get the most out of your Google Analytics Account ? Michael runs an SEO Company named INetZeal which promises to offer Effective Link Building & other quality SEO services. Hey Thanks for sharing this, I was aware about intelligence features, but do not know how to use it, now its clear, it is really a great feature. Useful post. Gonna try this very soon…! Pretty clear tips on Analytics intelligence and how to use it to create alerts and custom reports. Hi Micheal, thanks for this advice. I don’t use AdWords but I’ll share these tips on Twitter. I have a question – do you have any tutorials that feature the new version of Google Analytics? I can’t seem to find one. Google Analytics is great tool for every webmaster as you get to know about almost every details related to your sites. Total visits, Ranking Keywords, Location of Visitors, Usage of Browser and so on. I had been exploring the Intelligence tool a couple of months ago, and setup an alert. I haven’t looked too deeply into the tool, but it does look very useful and interesting. Thanks for the tutorial. Hi Micheal, thanks for sharing this great tip. Everytime I want to access my traffic reports, I used to login to the admin panel to get the stats. Now with this new tool, I can save that time and make it useful. Great tips. Looks like the custom alerts feature is very useful! Thanks for the sharing! I have been using Google Analytics too and it just never fails to surprise me with its awesome intelligent tools. What I make the most out of Google Analytics is knowing the bounce rate of my web page. I love the “automatic alert” tool because it keeps me updated about my site traffic so I would never miss a thing with the traffic generation of my site in any region. thanks for the tip…. i never knew there was more to google analytics than the normal stuffs i normally do on it. Thanks for sharing this information about Google Analytics Intelligence Section. I’ve never spent much time understanding everything about Google Analytics. I will try the steps you’ve laid out here. Thanks again! It can be as deep or shallow as you desire. One thing I noticed that for yesterday was that bounce rate for users from London was up 18% of the norm. Why, I have no clue. But for someone that loves statistics and uses them to watch for trends and set goals for the site it sure is fun. How can i track adsense clicks on analytics ? Is there anyway for that? Anybody reply me plz. how can i add adsense to analytics so i can see clicks on anlytics?? There is no code for that, Just go to the AdSense section in Analytics & connect to your adsense id. Then you can add a separate section to see clicks/earnings/eCPM etc. I am not able to see adsense section in analytics.. Plz say where it is.. Thanks for this post Michael ,I did not know that..
Google Analytics is very good to view the stats. That was a very good tip for me thanks for the info. I have Google Analytics tracking code on my website. While it is certainly powerful, I don’t see anyway I can use the information on my site. Specifically I want to add some statistics such as pageviews, visitors, most popular pages. Is there a way this can be done without logging into Google Analytics and exporting the reports? This is extremely cumbersome.Thanks. I haven’t use yet the Google Analytics in my sites. But this sounds to be nice. I think I’m gonna try this. Thanks again!